Colchester Junior Chess Club is created to encourage and help young people to play and learn chess in an enjoyable and safe environment. This will give young players an opportunity to make new chess-playing friends while being coach with their knowledge and skills in playing chess. 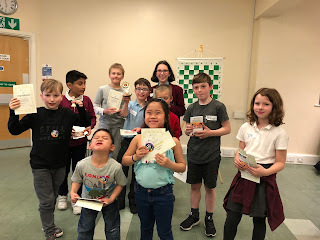 The purpose of the Blog is to promote Colchester Junior Chess Club in Colchester and its surrounding areas and junior chess in Essex. It was very nice to see most of you this afternoon and I would like to welcome our new members: Ethan Clarke, Dwayne Ramirez and Alexander Ramirez who is just 3yrs old, amazing. And just a few updates to mention. ( please feel free to ask me if you are unsure for your child to attend such level of compitition). 3. On the Leadership Board, Mae is still holding the top post and just below her is Loius then the rest of the members. In behalf of all the volunteers, thank you so much for supporting the Junior Club. Thank you so much for all the support last term. And just to remind you that the club will not be open during school holidays, so we will not be open this week. We will commence back on the 6th of September 2018. Please be advised that the club is close this coming Thursday 31st of May as it is half term break, we will reopen on the following week 7th of June Thursday. CONGRATULATIONS to the following for winning the Supremo and Suprema in the categories they have entered at the Megafinals hold last week. You have just imprinted a good impression for the club and a very good standard to follow by the other members. 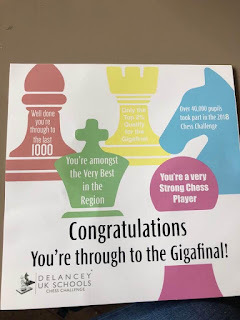 Well done for doing so well and very best of luck at the Gigafinals. Also, well done to Rezin for winning 2games at the competition. The club will be close this coming Thursday 17th of May due to unprecedented personal reason, apologies for any inconvenience. We will resume the session on the 24th of May Thursday, of which I hope to see you all. The club will be close for the next 2 weeks due to school holidays and will re-open on the 19th of April Thursday. Congratulations to Louis Thomas for winning the top of the Delancey challenge in the club for this year and for the others who were able to qualify for the megafinal. Also, well done to everyone who participated in the challenge.